Supreme Court rejects former PM's appeal of his conviction for accepting cash-filled envelopes from an American-Jewish businessman. Israel's Supreme Court rejected an appeal by former Israeli Prime Minister Ehud Olmert of his conviction for accepting cash-filled envelopes from an American-Jewish businessman. 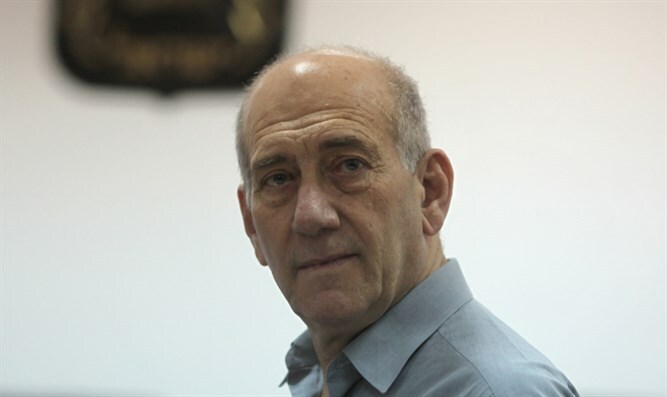 The court was unanimous in its decision Wednesday against Olmert, who now must serve an additional eight months in prison for his involvement in the so-called Talansky affair. He was convicted of accepting the money from businessman Morris Talansky and using it for personal rather than political expenses. Olmert is serving a 19-month sentence for a corruption conviction in the Holyland affair, which involved the payment of bribes to government officials by the developers of a luxury high-rise apartment complex in Jerusalem. Last month he submitted a request to shorten his sentence in that case; a December hearing is scheduled. The former prime minister did receive some good news from the high court on Wednesday: It rejected the state’s appeal of his acquittal in the so-called Rishon Tours affair, in which Olmert was accused of paying for family vacations by double billing Jewish organizations through the Rishon Tours travel agency. The court also rejected the state’s appeal against his suspended sentence in the Investment Center case, in which Olmert, then trade minister, was accused of granting personal favors to attorney Uri Messer. Olmert is the first Israeli prime minister to serve time in prison and to be sentenced to jail.